When we travel through a wine region, I love to go to cellar doors of some of the better known wineries whose drop I enjoy. I also love to just drive around and pick small random wineries, that I’ve never heard of before, and pop in just to see what’s on offer. A couple of days ago we were going through the Tamar Valley which is full of wineries. The first couple of cellar doors we stopped into were Pipers Brook and Jansz, fantastic cellar doors, great wines and fantastic staff. The third and last stop for the day (I’m on cellar door rations) was a winery we were driving past and I asked hubby to stop into so I could do tasting. Please note: Hubby doesn’t drink so he drives me around when I wine tasting, perfect! The winery is called Three Wishes Vineyard and wow! We drove up to a stunning manse with a quaint side building. We seemed to be the only ones there as the car park was empty, perfect for a chat with who ever was running the cellar door that day. We were lucky enough that Rosemary, the owner, was on cellardoor duty, she called us in and launched into a history lesson about the property and what an amazing tale! Rosemary and her husband have been on the property for about 20 years. They have only a small farm which produces about 500 cases of wine a year comprising of chardy, riesling and pinot noir varieties. 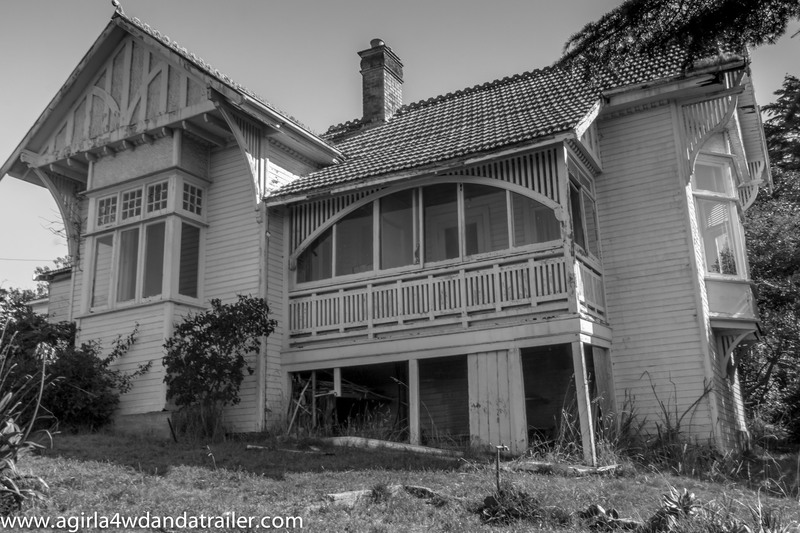 The magnificent manse next to the cellardoor was built in the late 1800’s and added onto in the early 1900’s. No one currently lives in the manse; however, there is said to be a resident ghost that has been known to open doors. 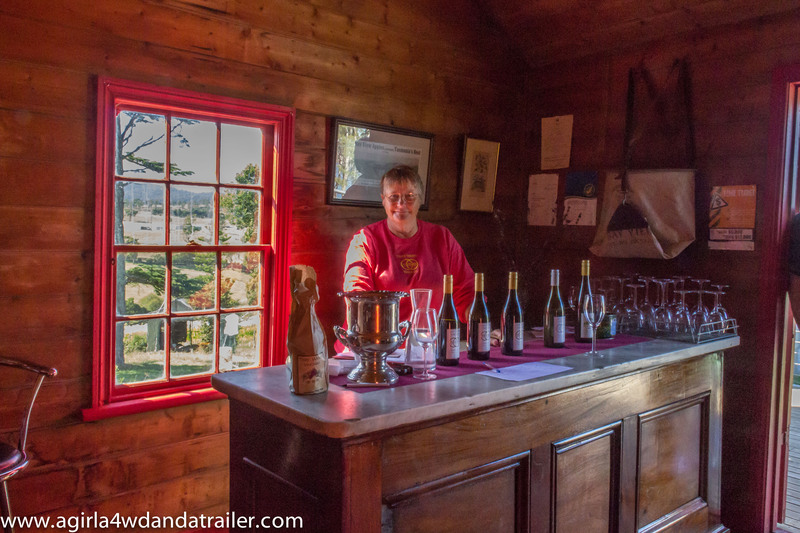 The cellar door is a building along side the manse and it was an old servants work building, which was once separated into male and female work quarters; however, Rosemary has knocked out the dividing wall and created an amazing space for receiving visitors. You can now walk through the cellar door and onto a back deck to stand in awe of the sweep views of the surrounding hills speckled with vineyards, herds of cows, ancient trees and a winding river. All of this before I’d even tried the wine and I wasn’t disappointed as the wines were fantastic! Overall Experience: 5/5 – great winery, will definitely visit again! Other amenities onsite: Lovely back deck where you can enjoy a glass of wine and the views, toilets. 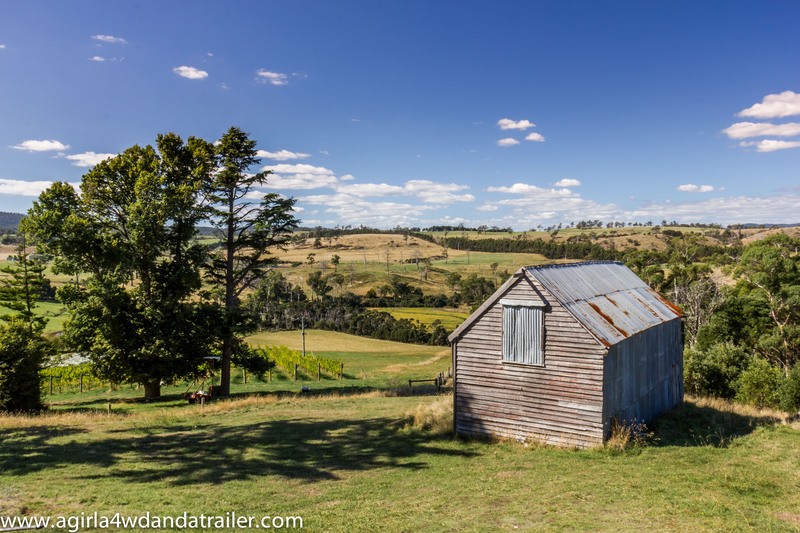 This entry was posted in Reviews, TAS and tagged Australia, australian travel, australian wine, camping, cellar door, cellar doors, jansz wine, Pinot Noir, pipers brook, Riesling, tamar valley, tasmania, tasmanian wine, three wishes vineyard, travel, vineyard, wine, winery on April 15, 2014 by monicabugno. 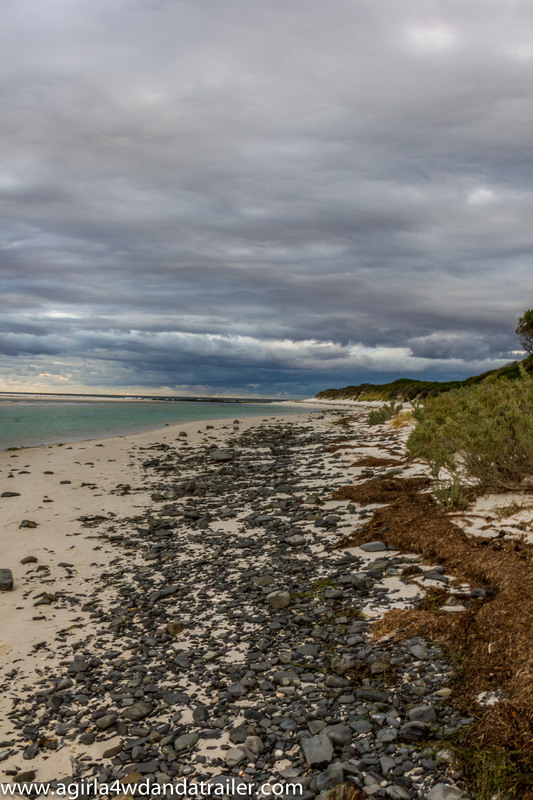 Instead of going to Binnalong Bay we decided to skip the crowded campgrounds and head up to the northern end of Bay of Fires which is a little more remote. We decided to stop in at Policeman’s Point and I’m so glad we did. 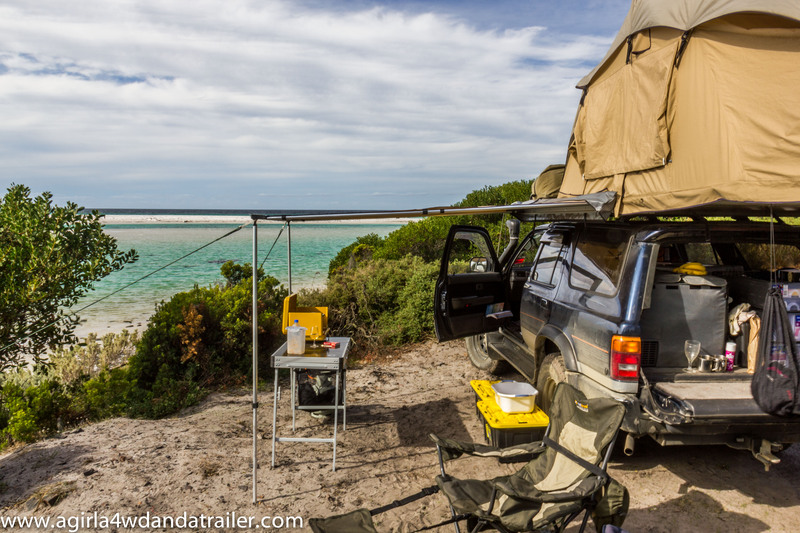 We set up our rig on a sand bank, literally 2 metres from the water, with the most stunning views we’ve ever had at a campground. We were a good distance from our nearest neighbors so it was like we had the whole place to ourselves, bliss! As dusk fell and the tides went out a pelican flew right up to me and just paddled around. Pelicans are huge! I had no idea! I was in the middle of doing my teeth and hubby yelled out that he saw a whale. He pointed out to a spot and then yelled “there, did you see it?” nope, I didn’t have my glasses on. I scrambled around in the glove box, grabbed them and put them on, just in time to see another one. We believe they were orca whales as they had the large dorsal fins sticking up like a shark but weren’t sharks as a number of them passed in a pod bobbing up and down. 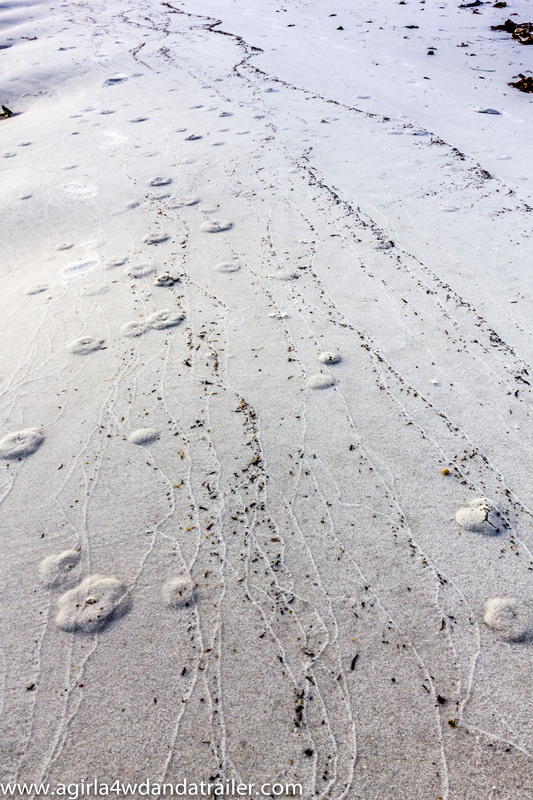 There are a number of seals in the area, which they eat apparently. So much wildlife at Policemans Point. 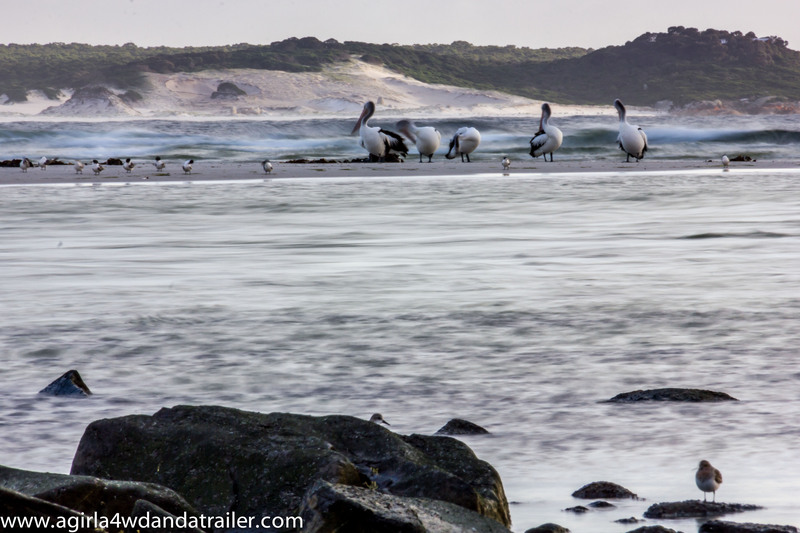 Perfect location, pelicans and whales and it’s a free campground, you couldn’t ask for better! 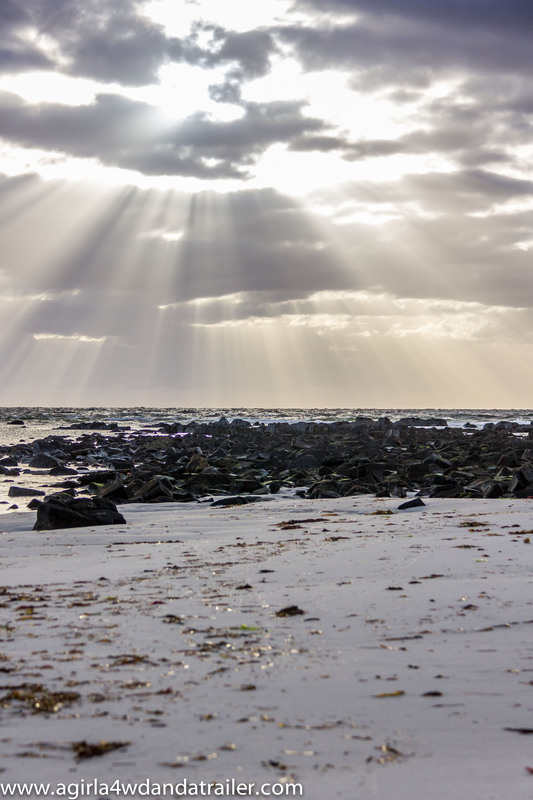 This entry was posted in Reviews, TAS, The Great Outdoors and tagged 4X4, bay of fires, beach, camping, camping tasmania, killer whales, orca whales, pelicans, policemans point, sunrise, Sunset, tasmania on April 10, 2014 by monicabugno. I hadn’t planned on visiting Port Arthur on our trip as I’m not terribly familiar or interested in Australian history. I did however, want to see The Isle of the Dead in Port Arthur. Can’t see one without the other so we went for a day and I’m so glad we did. 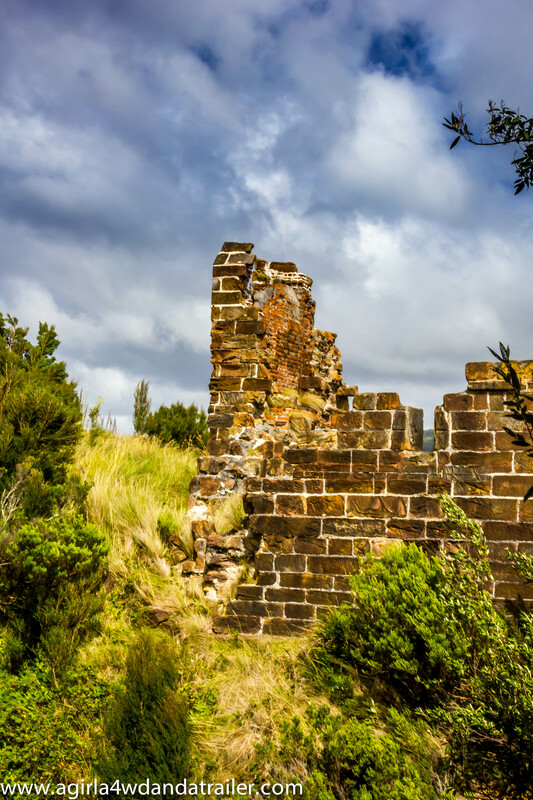 I could go on about the history of Port Arthur in this blog; but, really you could research that in your spare time. There were a few things that did really fascinate me while we were here and so I will make mention. The way the tourists are managed throughout Port Arthur is very well done. I have a degree in Tourism and Hospitality Management which really doesn’t get much of a workout. What I do like to check out while at tourist attractions is how the attraction manages the tourists and I thought Port Arthur did this very well. As part of the bronze ticket, the cheapest ticket you can buy, you get an ipod with a self guided tour so you can walk around on your own and have all the information at your finger tips. You are also entitled to participate in an introductory tour which goes every hour and a guide will walk you around and provide you with the information found on the ipod and other relevant stories. I also found the tour guides and staff in general to be fantastic. 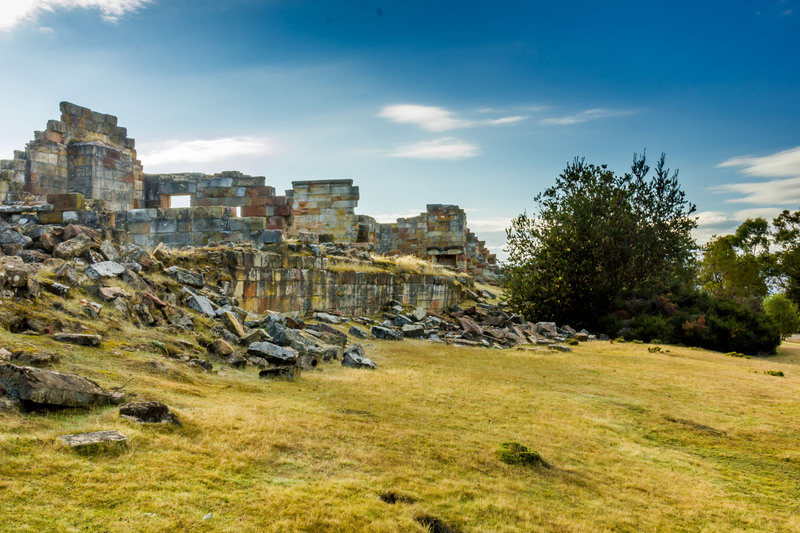 They are obviously passionate and very knowledgable about Port Arthur and liked to share stories about the convicts, the jailers and their families to really make the experience come alive for us visitors. As the main motivation for visiting Port Arthur was The Isle of the Dead tour we booked and went on it first. The Isle of the Dead is a small island off the Tasman peninsula. It was used as the graveyard for Port Arthur from 1833 to 1877. Around 1100 dead are buried here. Basically anyone who died was buried here so not only the convicts but officials, soldiers and their families. 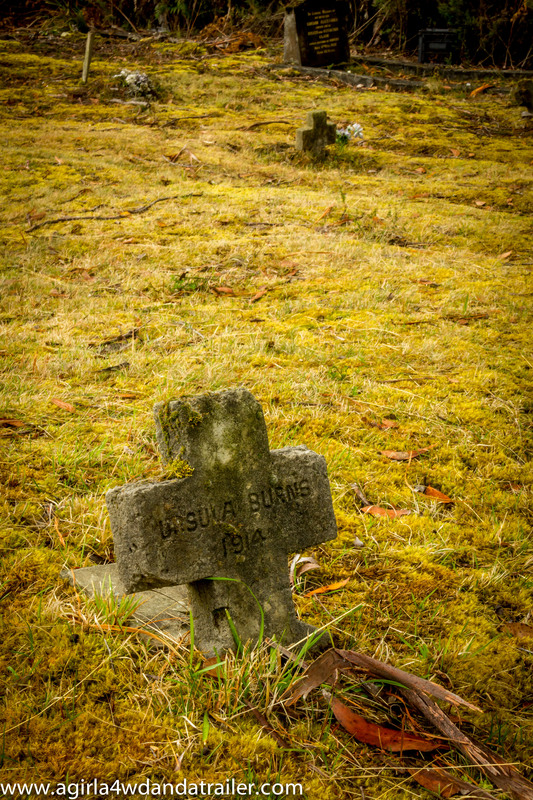 On the lower side of the island the convicts were buried, mostly without headstones in mass graves. It was forbidden to place headstones on a convicts graves; however, there are a couple of exceptions to the rule. The soldiers, officials and their families were buried on the higher north-western corner of the Island, class rules were strictly enforced in life and death for these people. The tour guide was engaging and obviously loved her job, she told us stories of some of the dead, the grave keepers, families and interesting burial facts. The other place I wanted to make mention of in this blog is the Coal Mines Historic Site. 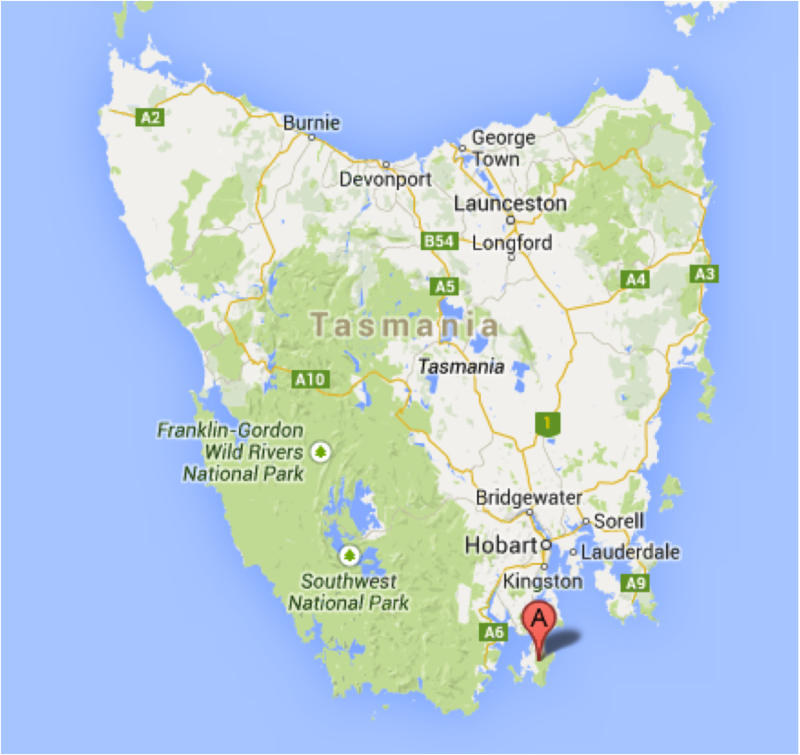 Port Arthur is on one side of the Tasman Peninsula and the Coal Mine is a drive to the other. It’s free to see, you just drive up and park. We didn’t know anything about the Coal Mine; but, a guy at the caravan park said that we had to go and see it so we did. We were the only people there at the time so had the whole place to ourselves and it was spectacular. We had a detailed information brochure and map of the area so we self toured around. It was worth the short drive out to see it. This entry was posted in Cemeteries, TAS and tagged Australia, Australian history, australian travel, cemetery, church, coal mine, convicts, Cruise, dead, graveyard, headstones, history, hospital, isle of the dead, photograpy, port arthur, ruins, tasman peninsula, tasmania, The Isle of the Dead, Tourism and Hospitality Management, tours, travel on April 4, 2014 by monicabugno. Bruny Island is an island off south east Tasmania. 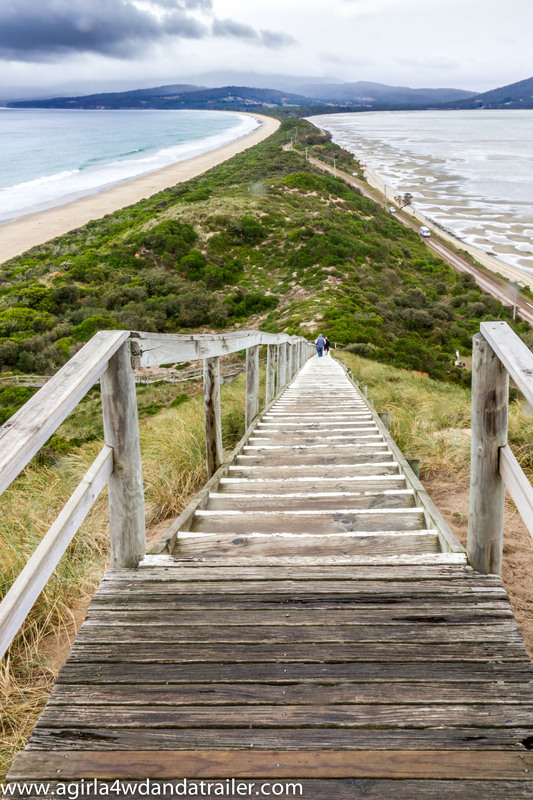 It has a bit of something for everyone, beaches, forests, driving tracks, cruises, holiday shacks, camping, fishing, hiking, restaurants, food and alcohol products. We came over late one afternoon via the car ferry, set up camp ready for exploring the island the next day. 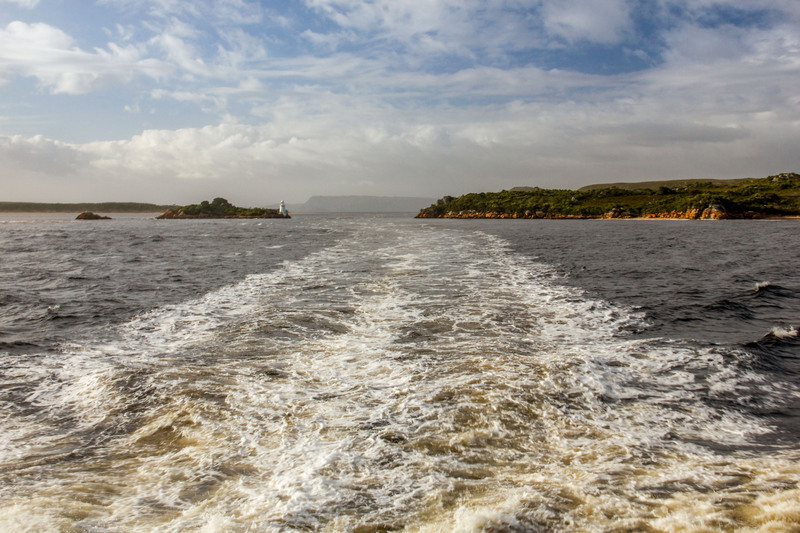 Unfortunately our trip over to Bruny Island was cut short due to bad weather. The thought of leaving the comfort and warmth of our 4WD to brave the cold, wet and windy weather that was plaguing the island was somewhat unappealing. Unfortunately that meant that instead of hiking, sightseeing and relaxing for 2 days we spent a day eating and drinking our way around the island instead, it’s a tough life. Lookout near our campsite, at the neck. We found this place along the way to the berry farm, It wasn’t listed on the tourist map provided to us so we didn’t know it existed until we nearly drove past it. We did stop in though to sample some fudge and OMG! The fudge is all made by hand from local products, a video was playing in the store, very interesting. We bought some choc mint fudge and kept going. Our first stop after leaving Bruny Island Providore was the berry farm. Unfortunately berries are out of season; but, they make sauces and jams when the berries are in season and always have that on hand. We sat down to some real coffee (seriously missing good coffee while travelling) and hot scones, just out of the oven with jam and fresh cream. Melt in your mouth amazingness! I sampled some of their Blackberry sauce and had to buy a bottle to take with me. This deserves a small mention as this tiny little cemetery had some rather interesting gravestones that I’ve never seen the likes of before. On a few of the graves were these tiny little cement crosses, about 20cm high just sticking out of the ground. The inscription seemed to just be the name of the deceased, strange. A lovely café and wine tasting shed on the other side of the island from the berry farm. The Chardonnay and Pinot Noir grapes are grown on the island and the Sauvignon blanc and Riesling grapes are grown in another part of Tas; but, all of the wines are made onsite. The wine was fantastic and I managed to walk away with just one bottle, if that doesn’t show restraint then I don’t know what does! I tried a couple of their cheeses at the Salamanca markets in Hobart, very pricey for cheese – $16 each for the 2 I purchased and well worth it! We went through a tasting of 5 cheeses on site and I wasn’t disappointed, the cheese is just sensational. You can eat a load of freshly made goodies onsite but I bought a freshly baked sourdough loaf with my cheese to enjoy later. You wouldn’t have thought that I would need lunch at this point; however, there is always room for fresh oysters and wine. The oysters are locally grown and freshly opened which I paired with a glass of Jansz bubbles, felt like I had died and gone to heaven! 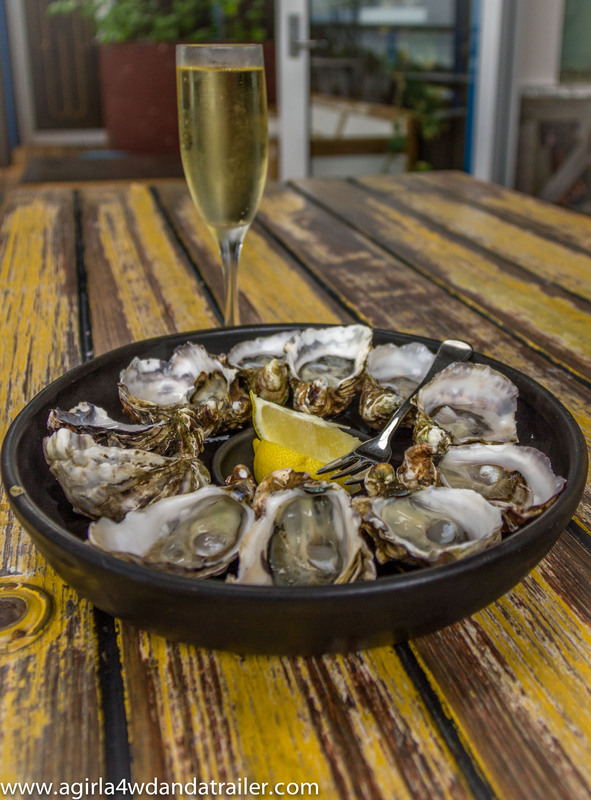 A dozen naked oysters and a glass of bubble was about $23, bargain! And our last stop enroute to the ferry was the smokehouse where a couple of platters of the locally made products (smoked in the back paddock) were waiting for me to taste, yum! We ended up with smoked chorizo pork sausages and hot smoked salmon. This was the last stop on our foodie / boozie’s tour of Bruny Island, now off to Port Arthur. I would love to come back again to do the hiking, there is always next time. This entry was posted in Cemeteries, Food concoctions, TAS, The Great Outdoors and tagged Australia, berries, boozie, bruny island, Bruny Island Berry Farm, Bruny Island cemetery, Bruny Island Cheese Company, Bruny Island Premium Wines, Bruny Island Providore, Bruny Island Smokehouse and Wine bar, cemetery, cheese, Ferry, foodie, fudge, get schucked, graveyard, headstone, island, jansz wine, lookout, Oysters, photography, scones, smoked meat, tasmania, travel, wine on April 3, 2014 by monicabugno. Hubby and I splurged out on a river cruise as a “honeymoon” present to ourselves. We decided to book seats on the Gordon River Cruise in the Captains Premier Upper Deck seats, all inclusive with leather seating, a private viewing deck, a dedicated guide, chef-prepared gourmet lunch, creamy Tasmanian cheeses and all you can drink Tasmanian wines and premium beers. At the normal price of $220pp, or if you have a RAC membership you are entitled to 20% off which brings the price down to $176/pp – thank you RACQ membership! We had an amazing day which started out with a glass of bubbles at 8:30am, life can’t get much better than this! We went through the Macquarie Harbour, past the man made training wall which took 3 years to build and acts as a funnel to increase tidal flow and therefore negates the needs for dredging to deepen the bay so ships can go through. We then went through Hell’s Gates. This is the entrance to the ocean from the bay. Convicts coming into Strahan named it Hell’s Gates because from their perspective they were going into hell and this was the entrance. We quickly stopped and had a bit of a quick look at the local fish farms floating along in the ocean and learnt some interesting facts. Did you know that Rainbow Trout and Ocean Trout are the same? The only difference is that Ocean Trout are raised in water that is salt underneath with a layer of fresh water on top (salt water is heavier and sinks). Apparently this environment is perfect for raising very fat fish very quickly! 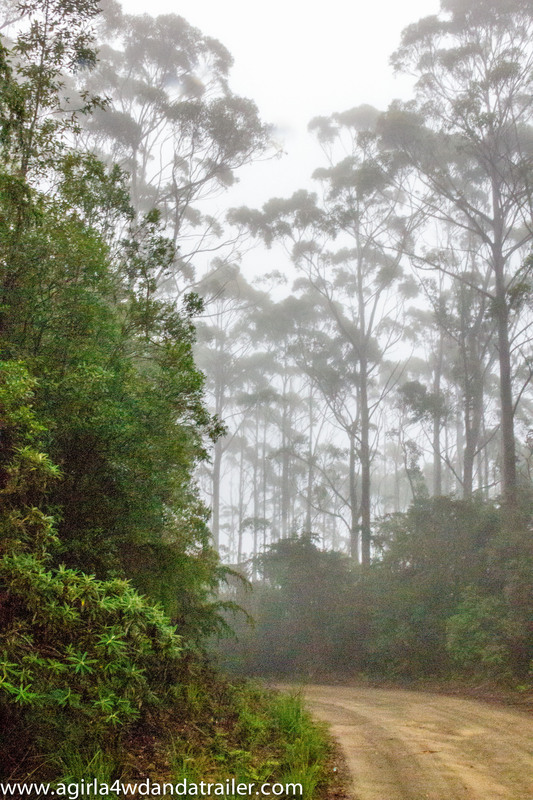 Turning back around, we headed down the Gordon River and after a while we stopped and walked through a section of rainforest where we learnt about Huon pine. Here is an interesting fact, Huon is older than birds. Back on the boat, more wine thanks, lunch and then Sarah Island. Along the cruise I had been reading a short book on Sarah Island, the history in this place is absolutely amazing! Unfortunately due to the harsh climate and time, there isn’t much left of the original buildings, some bricks here and there. However, the guides on the tour managed to truly bring alive the history and engage the entire group with reenactments and tales of the times. As we were leaving Sarah Island we were absolutely pelted by some of the strongest winds and rain I’ve ever experienced. As it was near to 2pm by the time we left Sarah Island, the boat turned around and took us back to Strahan. We thoroughly enjoyed the tour, the captain and the crew were amazing and the service we received was second to none. If ever you’re in this part of the world I highly recommend taking this tour, the Captain’s Premier Upper Deck Seats are very worth while! 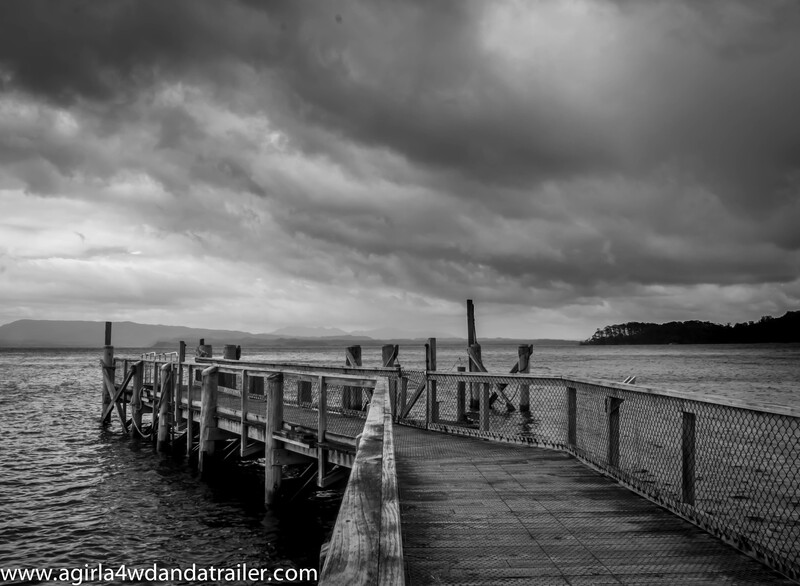 This entry was posted in TAS, The Great Outdoors and tagged convicts, Cruise, fish, Fish farm, Gordon River, hells gate, history, huon, Macquarie Harbour, rainforest, River Cruise, ruins, Sarah Island, Strahan, tasmania, weather, wharf, wine on April 2, 2014 by monicabugno. 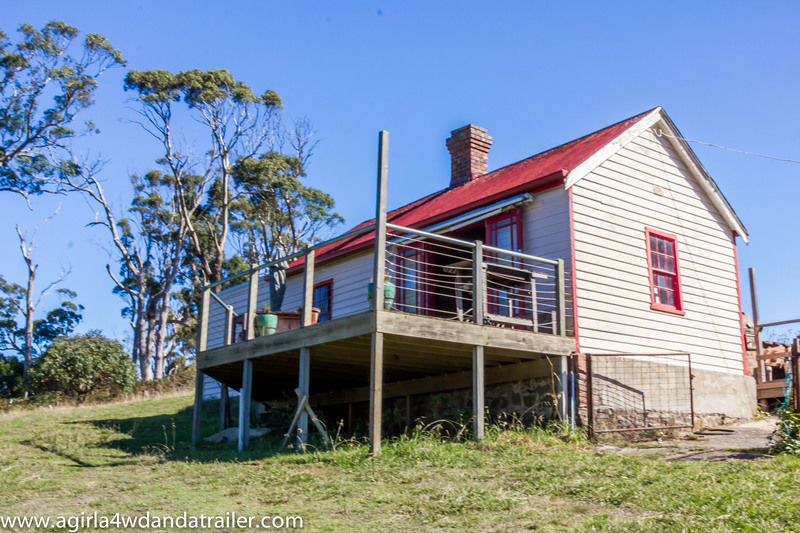 Before we came over to Tasmania I’d researched into the local produce, that being food and alcoholic products, that were a must see/try on our trip. Tasmania is becoming quite renowned for their microbreweries and whiskies with an already well-established wine industry. 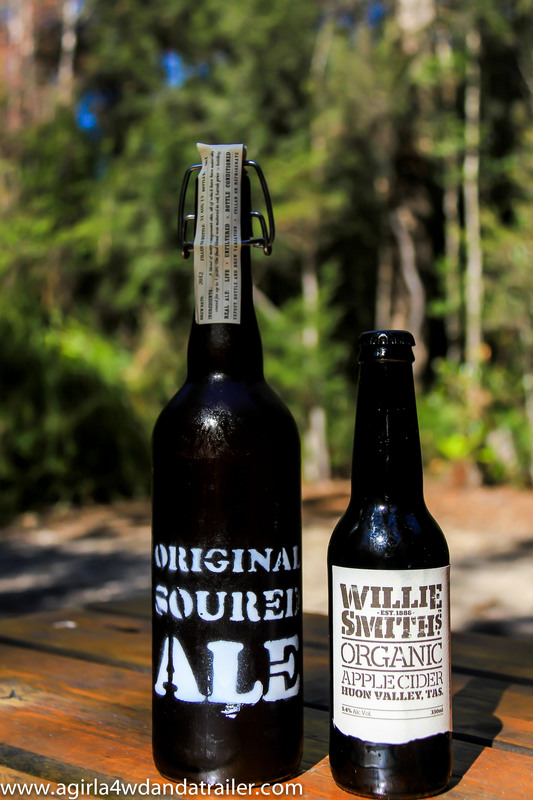 One of the breweries on my list was Two Metre Tall in Hayes; about 50 mins drive from Hobart. The owners and brewers are Jane and Ashley Huntington. They have had a rather fascinating past with Ashley as the senior winemaker of the BRL Hardy owned Domaine de la Baume France where they spent 10 years before returning to Tasmania and purchasing a farm. The Two Metre Tall Brewery is a working farm with grain, hops, fruit and cattle, you can actually purchase their beef from the bar onsite. 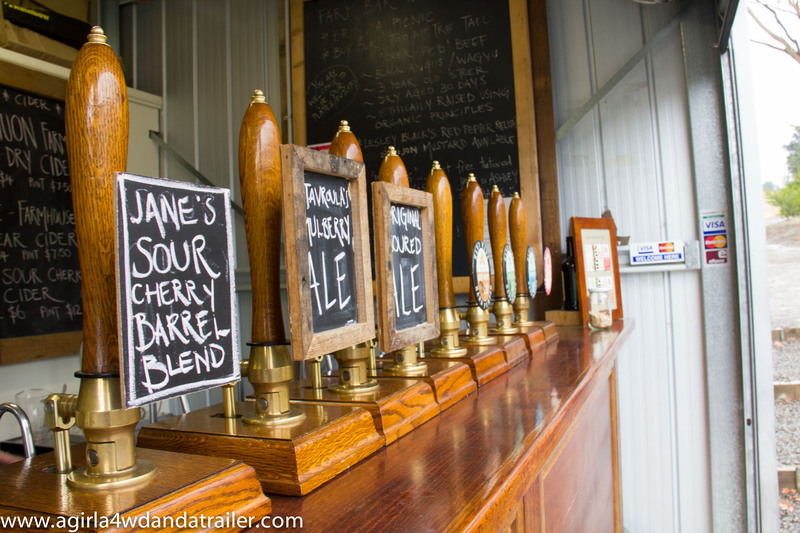 Yep, they have turned a shed into a bar with a selection of ales on tap for you to pop to taste, drink and takeaway. We came in on a Thursday arvo at about 2pm, in the rain, and there was no one else there. In fact Jane was just setting up the bar as Ashley had been fanatically brewing since 4am that morning. 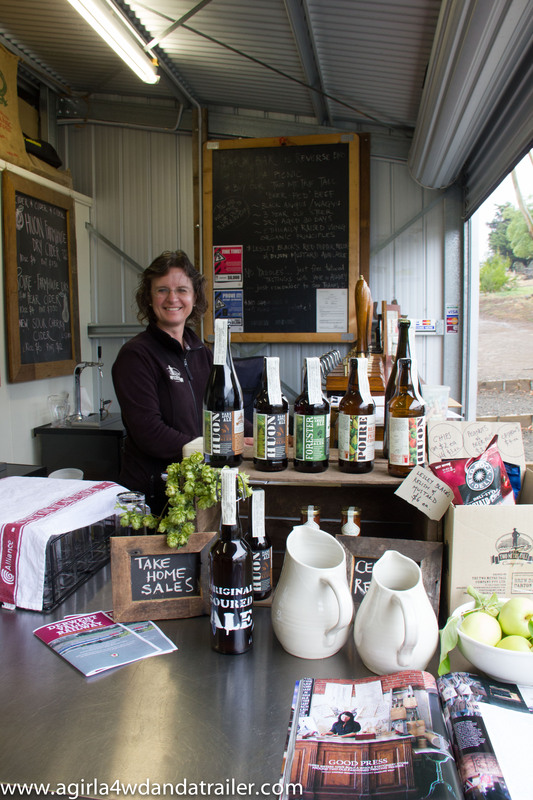 We went through all the ciders and ales on offer and she passionately explained where all the different components that make ales and ciders came from with the majority grown onsite, locally sourced in the immediate area and Tasmania. Jane told us about a local lady with a 100 yr old mulberry tree, she picked over 30kg of mulberries, which were added to a barrel of cider, just one barrel as that’s all there was enough for and It has sold out. A number of batches they make are on a small scale like this. I decided to walk away with a bottle of their Original Soured Ale. This is a blend of 1-3 year old tank and barrel aged soured ales. Two Metre Tall uses a mixed fermentation technique, which apparently isn’t common, to make their Ales. We had such a fantastic experience; Jane is so knowledgeable, attentive and personable. If it hadn’t been raining heavily we would have loved to sit on the benches provided and spend some more time onsite, but it wasn’t to be this time. 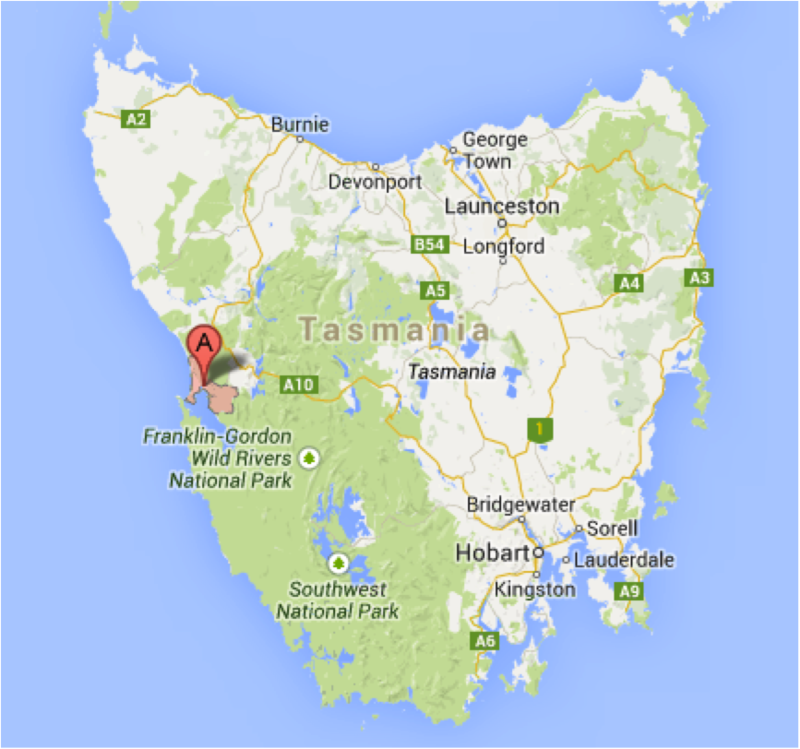 This just means that we will need to visit next time we visit Tasmania. 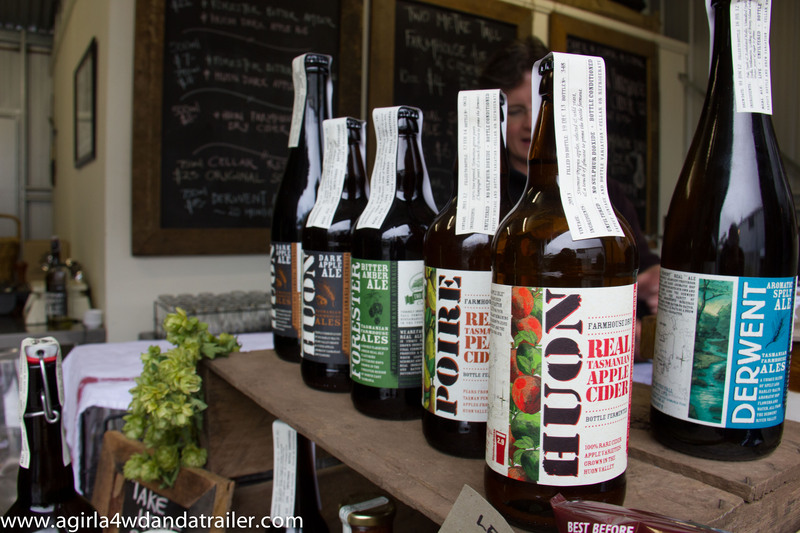 This entry was posted in Reviews, TAS and tagged Ale, Australia, Beer, Brewery, cider, farm, Hobart, Local Produce, tasmania, travel, Two Metre Tall on March 28, 2014 by monicabugno.